Bursitis usually occurs in high-wear joints such as the shoulders, the elbows or knees. While the inflammation often only initially causes slight friction, there are still noticeable symptoms such as severe pain, redness, and warmth around the affected site over time. Knee bursitis often relates to the bursa affected above the kneecap or those below it. 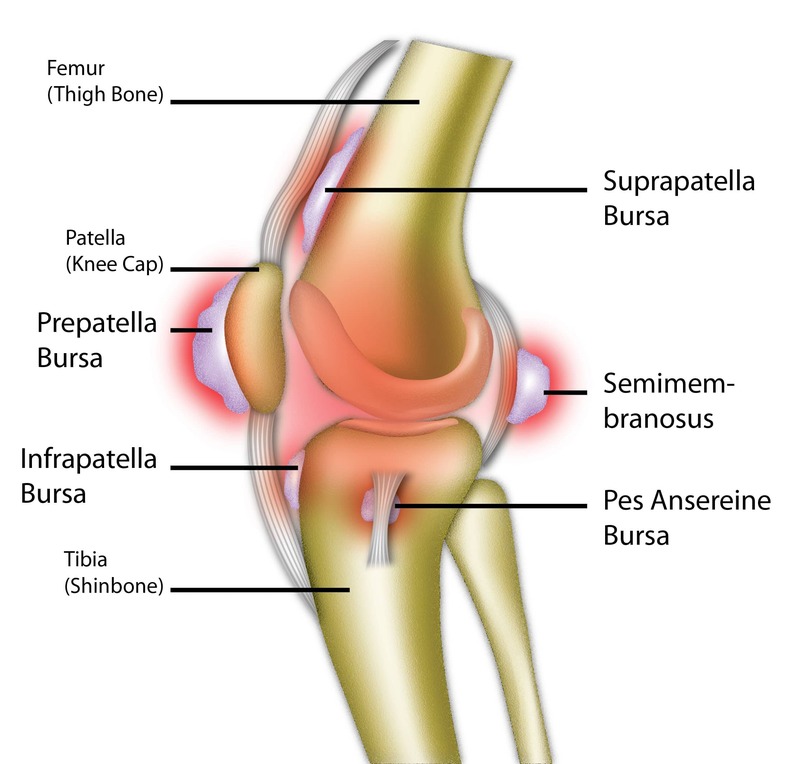 The bursae above the kneecap is often referred to as bursitis prepatellar, the second case is referred to as ‘bursitis infrapatellaris’. But there are also other bursae around the knee, which may ignite (like the bursa anserina). Infectious diseases such as tuberculosis or gonorrhoea can also put an individual at the risk of bursitis. A particular common cause for knee bursitis is an overload of pressure on the knee joints such as persistent or recurrent movements, such as those which occur during long-distance running. , Footballers or wrestlers may be affected by permanent irritation of bursitis in the knee. The continual strain caused by minor injuries can also eventually lead to an inflammation of the bursa. External forces such as a blow to the knee can cause the bursa to fill with blood. Through an open injury near the bursa, bacteria can enter the wound and cause bacterial bursitis. With prepatellar bursitis, a reddish swelling of the skin above the patella after is possible after a few days of its occurrence. The actual knee joint is not affected, but due to the inflammation of the bending of the knee, it is especially painful. Initially, the individual may notice a grinding sensation, with stronger inflammation, synovial fluid is produced in greater quantities. The result is an effusion, which feels firm and elastic. There is tenderness, swelling, heat, pain on movement, and sometimes redness. When bursitis infrapatellaris occurs, there is usually a painful, reddened swelling directly below the knee, usually on both sides of the patellar tendon. Overstretching and strong bending of the knee causes pain. If the bursa anserine is the problem then the sufferer will often mention complaints about climbing stairs or high platforms. The pain is indicated on the inside of the knee or slightly below. Obesity, arthritis, and the female gender are all three major risk factors for bursitis in the knee. After a thorough examination of the affected the knee, a qualified doctor can quickly recognize the type of palpation in the knee if it is bursitis or not. Most often the area in the knee around the patella will be tender and maybe painful to touch. In addition, it can be seen as a sort of fluid-filled cushions in ultrasonic bursitis. If it is already a prolonged inflammatory response, the edges of this “water bag” may already have thickened. When treating bursitis in the knee, the same principles (conservation, cooling, anti-inflammatory medication, etc.) apply as for any other bursitis. The knee is stabilized by many muscles. Keeping these specifically trained and regularly stretched can help to reduce the load on the bursa and thus prevent (re) infection. Usually, bursitis can be treated conservatively. The most important aspects of treating bursitis of the knee includes protection, immobilisation, and cooling of the affected knee. This is usually done with the help of rails. The leg must be elevated and supported for faster healing. Analgesic and anti-inflammatory medication can also help the process. Strong effusions can be punctured in order to relief the pressure. Sometimes laser and ultrasound treatments can be used in advanced cases. In a recurring bout of knee bursitis or when it is caused by bacteria (purulent bursitis) surgery may be necessary, in which both the facilities and the entire bursa is removed. In addition, a bacterial bursitis is treated with antibiotics to fight the infection and prevent the crossing of the bacteria into the bloodstream and thus the further spread of the bacteria.